Looking good at a festival can be somewhat of a challenge. After all there’s mud and (usually) rain to contend with, not forgetting the lack of showering facilities. But the muddy terrain and traditional British weather are all part of the festival fun, and it wouldn’t be a true festival if everyone didn’t get a little messy, right? That being said, no matter how muddy our wellies get, we’d all still like to look somewhat presentable. You didn’t spend weeks picking your outfits for nothing! Longevity is key when you’re picking your foundation for a festival. You don’t want to be constantly re-applying in between sets do you? I didn’t think so! 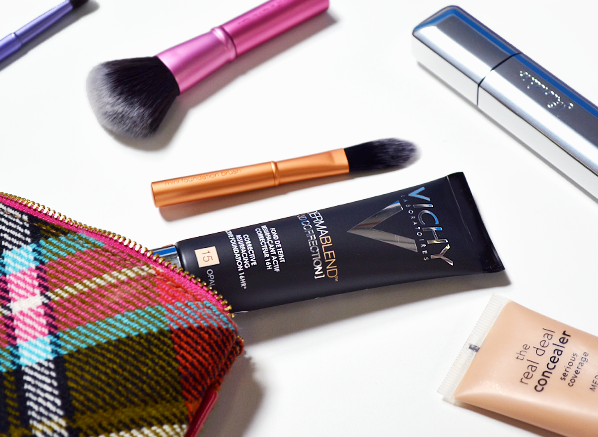 The Vichy Dermablend 3D Corrective Foundation is my top pick for someone that’s off to a festival this summer, it’s high coverage, long-lasting (16 hour wear), mattifying and also has added skincare benefits – what more could you ask for? Oh, maybe some SPF? Yes, it has that too, an SPF25! Enriched with salicylic acid and eperulin, this base not only covers up blemishes, it also helps to reduce their appearance over time. So as you wade through the muddy fields your foundation will be working away on perfecting your complexion. I don’t know about you but if there’s only thing that helps me feel a little more put together, it’s tidy, well-groomed brows. But after a disrupted night’s sleep the last thing you want to do is spend hours perfecting your brows. That’s when the Givenchy Mister Brow Filler comes in. Quick and easy, the brow mascara grooms your hairs into place, fills in sparse areas and leaves your brows looking full and thick with a powder finish. Waterproof and quick drying, its as if the Mister Brow Filler was made for your festival makeup bag. If you thought the only thing you needed to pack for the rain was an umbrella, think again. The last thing you want is mascara running down your face as you’re trying to enjoy the music, so a waterproof mascara is a must. The Guerlain Maxi Lash Waterproof Mascara is a product you could never regret buying. Not only does it give peace of mind when it comes to panda eyes, it also thickens, lengthens and separates your lashes. So, when time is of the essence and you’re rushing to make the first song of your favourite band, this mascara will take you from ‘just woke up’ to ‘festival ready’ in a single sweep. Late nights and loud music are a given when you go to a festival, so makeup that helps disguise your under-eye bags is a necessity. This makeup pick needs little explanation, the clue is in the name. But what I will say is that it’s high coverage, water-resistant and does a jolly good job of making everyone think you’ve been at a retreat rather than a festival. Enriched with antioxidant centella asiatic extract and vitamin E, the long-wearing concealer also helps protect skin against environmental damage – so it really is a no-brainer for happy campers. Wherever you go in a festival it’s usually cramped and busy, so its inevitable that you’ll get a little hot and sweaty. So, number 5 in this beauty line-up is a pressed translucent powder (with that all important mirror). Ideal for reducing shine when you’re a little oily and minimising the look of fine lines and imperfections, the Touch Up Veil is a quick and easy product that you’ll be so glad you packed. Small enough to slide into your cross-body bag for touch-ups, the powder will ensure the only thing shining is the glitter in your centre parting! Packing about 10 lipsticks just isn’t an option when you’re going to a festival. So, unless you’re planning on staying loyal to one lip look all weekend you’ll want something with options. The Anna Sui Lip Color Palette offers all the lip options you could ever want, from brick reds to vibrant corals, you’ll be able to mix up your look without taking up all the space in your backpack. Slimline with a convenient lip brush, you could also use this palette to create beautiful face art too – you are at a festival after all. Not only are these brushes the cutest brushes I’ve ever seen, but they’re also just as soft and effective as their bigger sisters. Comprising of a multi-task, foundation and eyeshadow brush, this trio will ensure your makeup looks as good as it does at home – you’ll be the envy of all those that thought they could ‘make do’ without their favourite tools! What are your festival beauty essentials? Tweet me @EscentualCeryn or comment below! Advised by friend to get this to 'finish the look' and it does just that! This entry was posted on Thursday, June 23rd, 2016 at 1:14 pm and is filed under Make-up, Spotlight On. You can follow any responses to this entry through the RSS 2.0 feed. You can skip to the end and leave a response. Pinging is currently not allowed.